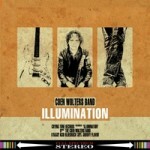 Share the post "Album review: COEN WOLTERS BAND – Illumination"
Coen Wolters motto is, ‘let it rip and don’t be shy about it’. ‘Illumination’ is a hard hitting, well played and produced slice of funky tinged acid blues-rock. It’s an album that blows away the cobwebs of the blues rock genre and finds equilibrium between the band’s passionate performance and the sterile studio environment. The attention to detail on the project is also very impressive, ranging from the aptly named Crying Tone records to the way the Coen changes his tone for a succession of bog toned solo’s on his own custom built guitars. There’s a real depth to his song writing too, matched by inspirational playing and tightly locked arrangements, which are still offset by moments of spontaneous beauty. It’s American sounding music, perhaps reflecting the fact that Coen – like Oli Brown before him – played with Blind Dog Smokin’ in the States, but his songs are wholly his own and his grooves and solo’s are intuitive without the slightest suggestion of any cliché. Above all the band have a keen sense of dynamics, predicated by a supple rhythm section that knows when to push and when to hold back, lending the 11 tracks an organic, spontaneous feel. Coen is the kind of guitarist who knows how to wrack up the tension in a song and then resolve it. He opens the album with the sledgehammer funk of ‘Time Of Day’ and follows that with the first of two versions of ‘Complicated’. He explores a beautifully sculpted wah-wah inflected solo, which he partly revisits on the slow blues of ‘Into The Light’. It’s a song that is perfectly resolved by a sprinkle of volume swelled notes. He rises again over the funky groove of ‘You, Me And Your Monkey’ while on ‘Home’ he places the emphasis on melody and his expressive vocals. There’s a refreshing focus on quality song-writing, passionate vocals and solo’s that are are an integral part of the song rather than an adjunct. ‘Illumination’ also sounds like a real band who would relish playing this material live. ‘Yellow Eyes’ impresses with its percolating rhythm and distorted tone on the solo, over a thundering rhythm section. This album is also that rare example of a self production with no excess baggage. Coen sticks to pushing the grooves, maintaining the consistency of his song-writing and driving his band on to make the most of the some excellent material. He adds a layered organ sound and a coruscating solo on the melodic ‘Shake My Tree’ before ripping into the tightly wrapped funk of ‘I’m Gone’ as part of an album that envelopes you with its big sound, exciting band interplay and deep grooves. This is apparently the band’s fourth album, but it sounds as if they’ve been waiting a lifetime to record it, and the solo on ‘I’m Gone’ would surely bring a smile of recognition to that other acid blues rocker Stoney Curtis, before the band powers back into the groove before a perfunctory finish. This album is so tightly wrapped that when the band launch to the shuffle of ‘Brand New Day’ it sounds fresh and exciting rather than filler, even if the vocal and arrangement is evocative of The Hoax. Coen sings: You’re so mature and I’m a kid inside’, and only a rather limp ending robs the song of a deserved finale. ‘Devil Train’ is one of four co-writes with Lance Johnson and marks a return to the band’s bristling funky blues-rock template. It’s a shade too busy, but is counter balanced by a decent hook and another weighty solo. ‘Illumination’ is a good title for an album that shines a refreshing spotlight into the fundamental reaches of blues-rock. If the hardest thing for a blues-rock artist is to come up with something original and new, then the Coen Wolters Band do so through the sheer vivacity of their playing and Coen’s self evident confidence in his material. This entry was posted in ALBUM REVIEWS, ALBUM REVIEWS (Mobile), All Posts and tagged album, Blind Dog Smokin, blues, Coen Wolters, guitar, Illumination, Lance Johnson, Oli Brown, review, rock, Stoney Curtis, The Hoax. Bookmark the permalink.